St Mary’s Church is Grade I listed and is the oldest building in the Borough of Watford, making it the primary focus of the town’s ecclesiastical history. The date of the first church on the site is not known, but there is evidence that there was a Church here in the 12th century. The oldest surviving parts of the structure date from the 13th century. As the town grew, so did the church: the addition of a second aisle, a chapel and a tower in the fifteenth century suggest increased prosperity in the town by that period. In 1951 Watford Council took over responsibility for the maintenance of the grounds and it was reconfigured as a “Garden of Remembrance” or “Memorial Garden” at the time of the Festival of Britain. 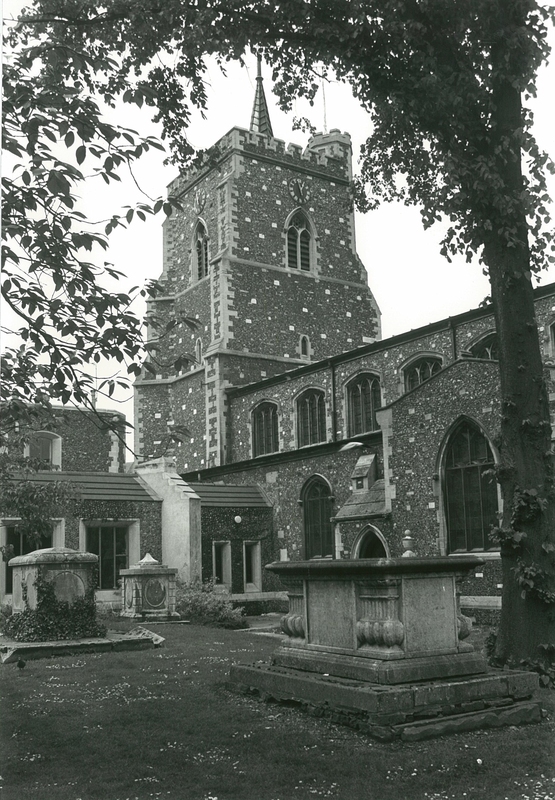 Changes occurred again in 1979 when the Church centre was built. The social history associated with the project is considered to be important because the memorial structures relate to a number of significant residents of the Parish of Watford who were influential in the development of the town as an industrial centre. These include the Dyson family, founders of the brewery which evolved into the Benskins brewery; the Clutterbuck family, one of whom wrote the “History of Hertfordshire”, and the Finch family who were associated with Frogmore House. The tombs that have been restored date from between 1725, the Isaac Finch Tomb and 1867 when John Dyson was buried in the Dyson Tomb. This is interesting in itself as St Mary’s Churchyard was closed to new burials when the cemetery in Vicarage Road was opened in 1858. However, there were people important enough, or with enough influence, to be able to open up a family plot for further burials and the Dyson family had this local influence. This 140 year period was a significant time in Watford and the town changed significantly. In 1725 Watford was fairly indistinguishable from any other small Hertfordshire market town, but times were changing, and some of this change was driven by the people buried in the tombs. Some came from families who had lived in the parish for generations; others were newcomers, professional people or merchants who seem to have returned to Watford from London. Socially, this led to a mixture of people living in the area and consequently being buried in the St Mary’s Churchyard. Many were from a trade background, but as can be seen from the quality and size of their tombs had clearly become quite wealthy. This meant that socially they were able to become upwardly mobile, some arranging good marriages for their Children. The Deacon Family who had been living in Watford for generations married one daughter to a lawyer and another to a City of London Merchant. Some even began to consider themselves as gentry. Christopher Dalton, who was from a Milling family, is listed on both his tomb and in an 1852 street directory as Christopher Dalton Esquire. This implies that he had become wealthy enough to own his own property. By the time John Dyson was buried in 1867 Watford had become a very different town. Development had begun away from the High street, as roads were laid out and houses built on what had been farmland and pipes had also been laid for water and sewage. There was now a new local authority, referred to as the ‘Local Board of Health’, what would become today’s Borough Council. 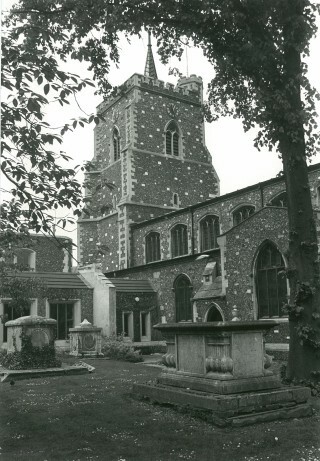 By then the main churchyard of St Mary’s had been closed to burials and the new cemetery on Vicarage Road had opened. More information about the Tombs Restoration Project can be found here. This page was added on 22/08/2013. How odd, not mentioning the tombs of the Earls of Essex from Cassiobury! These 500-year-old memorials inside the church are incredibly beautiful pieces of memorial sculpture and some of the finest in the country – as good anything you’d see in Venice or Rome! There are also finely decorated fittings & oak pews designed by the great George Gilbert Scott. Most people in Watford are ignorant of this hidden gem. My mum & dad were married there on october the 7th 1972. They are still happily married. My grandparents lived in southsea avenue, so it was a short trip for my mum on her wedding day.